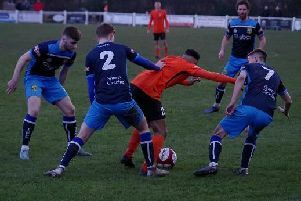 Tadcaster Albion won a home league game for the first time since mid-October when they overcame Goole by a 3-0 scoreline. Goals from Dan Thirkell, Erico Sousa and Josh Greening steered the Brewers to a long overdue Evo-Stik Division One North success at the i2i Stadium, a result that keeps them 15th in the table. After 10 days without a game following last weekend’s postponement at Glossop, manager Billy Miller made four changes to the side that beat Shaw Lane in the League Cup last time out. Josh Barrett, Tom Corner and Sousa were all named in the starting XI, along with Gregg Anderson who was back to captain the side after returning from his honeymoon. Jason Mycoe, Michael Ingham and Andy Milne missed out through injury with Jono Greening suspended. Albion started on top and looked menacing as Erico Sousa ignited early fear into the opposition by jinking and driving past four players before firing way over the bar. Despite the positive beginning from Miller’s men, it was the visitors who came within a whisker of breaking the deadlock inside 10 minutes. Bobby Johnson stood over a free-kick 25 yards out and curled an exquisite strike, only to see it crash off the inside of the post. Following a couple of weeks out with a hamstring injury, hitman Corner was back leading the line for Tadcaster and looked back to his best. Winning aerial dual after aerial dual and giving the away defence constant nightmares, he almost opened the scoring after 20 minutes after cutting inside and curling agonisingly over. Livewire winger Sousa continued to cause Goole all sorts of problems as he got the better of Will Ramsay time and time again. Even when the Vikings doubled up on him he still seemed to somehow find a way out of a cul-de-sac and into space. The home side were certainly in the ascendency and going through the gears, but Goole were screaming for a penalty kick half way through the opening period. Nathan Modest felt that Barrett had impeded him in the box, but referee Jimmy Price waved away strong protests. Six minutes later, Taddy took the lead when Erico Sousa got the better of his man once more and picked out Corner who teed up the onrushing Thirkell. Thirkell’s blast towards goal was blocked by defender Richard Patterson, but only back into the midfielder’s path and he composed himself and impressively passed the ball into bottom corner past Thomas Beaurepaire. Recent signing Chandler Hallwood has been in exceptional form between the sticks since joining the club and he was called upon for the first time as the interval loomed. Former Leeds United youngster Sanchez Payne nipped in down the right-hand side but was denied brilliantly from point blank range by the Albion gloveman. Taddy continued to dominate the contest after the break as Goole slowly started to be worn down by their relentless hosts. It was a matter of when, not if, the Brewers would extend their lead, and Sousa tried his luck, striking low from the edge of the area, but Beaurepaire was equal to it. Having earlier registered his first goal for the club, Thirkell should have netted his second in the 56th minute when Sousa’s corner found its way to the midfielder at the back post, but he could only poke over the mark. Taddy did however deservedly double their lead shortly after the hour-mark. Rob Youhill was putting in another barnstorming performance on the right-hand side and he made the goal by beating former Taddy man Steve Jeff and whipping into the danger zone. Goole skipper Robert Constable did well to deny Josh Greening, but Sousa followed up and hammered into the back of the net to claim his first in a yellow shirt. The closest the visitors came to finding the back of the net in the second half was when Jeff was played in down the left-hand side and the full-back’s cross-shot flashed across the face of goal. Nevertheless, the three points were made safe 14 minutes from time when Josh Greening’s high in-swinging corner curled straight into the far corner of the net. Taddy almost added a fourth in the final stages when Jordan Armstrong’s volley across the face of goal had just too much on it for the stretching Josh Greening, and that was to be the last action of the day.